High-Ranking North Korean Official Is Traveling To New York : The Two-Way According to President Trump, former military intelligence chief Kim Yong Chol will be holding meetings on a possible U.S.-North Korea summit. 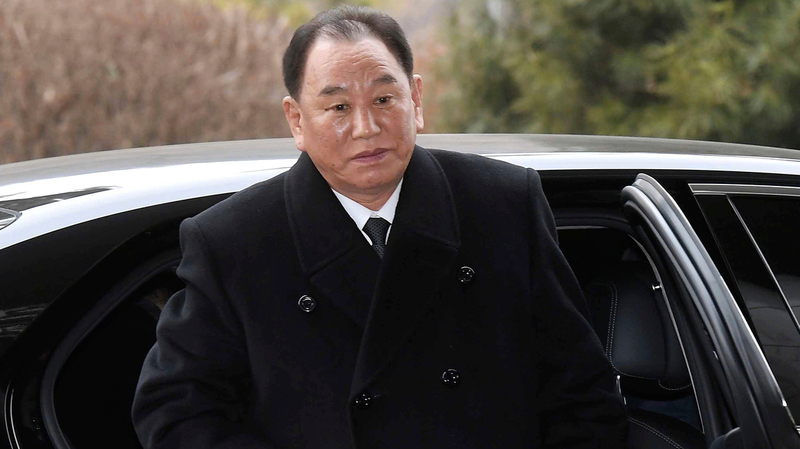 Kim Yong Chol, vice chairman of North Korea's ruling Workers' Party Central Committee, arrives at the Korea-transit office near the Demilitarized Zone dividing the two Koreas in February. President Trump confirmed Tuesday that Kim is headed to New York discuss a possible summit with Kim Jong Un. The former head of North Korean military intelligence is traveling to New York, according to President Trump, who says Kim Yong Chol is coming to the U.S. to discuss the possible summit with Kim Jong Un. The senior North Korean official's trip to the U.S. was initially reported by South Korean media, which said Kim Yong Chol had flown to Beijing and is booked on an Air China flight to New York that leaves Wednesday. "We have put a great team together for our talks with North Korea. Meetings are currently taking place concerning Summit, and more. Kim Young Chol, the Vice Chairman of North Korea, heading now to New York. Solid response to my letter, thank you!" In a letter last Thursday, Trump abruptly canceled the summit that had been slated for June 12 in Singapore. That followed comments from North Korean Vice Foreign Minister Choe Son Hui, who said his country wouldn't "beg the U.S. for dialogue" and who called Vice President Pence a "political dummy" for suggesting North Korea could end up like Libya if Kim Jong Un doesn't make a deal. In late 2003, Libyan leader Moammar Gadhafi voluntarily dismantled the nation's nuclear weapons program. But in 2011, during the Western-backed Arab Spring demonstrations, Gadhafi was deposed and then killed by rebel forces. Despite the cancellation, talks about the summit have continued, including a meeting between North Korean and U.S. delegations on Sunday. Kim Yong Chol is a veteran of diplomacy with South Korea who is considered to be Kim Jong Un's right-hand man. He visited South Korea as part of the North Korean delegation to the Winter Olympics, which drew global attention after the dramatic shift from tension to rapprochement on the Korean Peninsula earlier this year. Kim is also widely believed to be behind the 2010 sinking of the Cheonan, a South Korean naval vessel, in which 46 seamen died. North Korea has officially denied the incident. But in March, when South Korean K-pop groups appeared in Pyongyang, Kim Yong Chol went to speak to the South Korean press that had traveled for the performance and reportedly introduced himself this way: "I'm Kim Yong Chol, the man you blame of sinking the Cheonan." When Pence visited South Korea for the Olympics, he visited a memorial honoring the sailors who died. At the closing ceremony of the Winter Games, Kim Yong Chol was seated in the same VIP box as Trump daughter Ivanka Trump, but they did not speak. It was a repeat of the opening ceremony, at which Pence did not greet Kim Jong Un's sister, Kim Yo Jong. What a difference a few months makes. South Korean news outlet Yonhap had said Kim will hold a meeting with Secretary of State Mike Pompeo, but it is not clear whether that information is accurate. Kim led the delegation that hosted Pompeo on a brief visit to North Korea earlier this month, greeting him at the airport and also bidding him farewell at the steps of his plane.